Cottingley Community Centre came to the rescue when residents were evacuated from their homes on Sunday evening (4 June 2017). 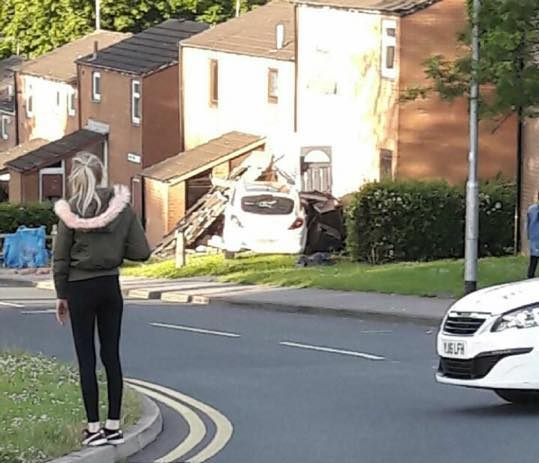 The incident started at about 8pm when a white Corsa lost control, hitting a taxi before crashing into a house, 7 Fair View, off Cottingley Drive. The crash caused extensive damage to the entrance porch and ruptured a gas pipe. Police have confirmed that the car was stolen and that the driver fled the scene. As a precaution nearby residents were evacuated and the emergency services asked staff to open the community centre. Staff from Transco and National Grid attended the incident alongside Police, Fire and Ambulance services. Some 40 properties had their gas and electricity disconnected for a number of hours. The community centre stayed open until midnight serving tea and biscuits and giving people time to find alternative accommodation if they needed to. South Leeds Life understands that the tenant of the property is staying with family whilst Housing Leeds surveyors assess the damage caused.